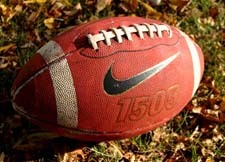 When it comes to fall fun, you won’t find a more enthusiastic group of fans than at a football tailgate party. Tailgating is a tradition, rite of passage if you will. Whether tailgating at the game or in your own backyard, here are a few tips to keep the day fun with minimal side effects. Keep reading for a fantastic fall weather sangria punch your guests will love! Stay hydrated by keeping plenty of water handy. Try homemade fruit, vegetable or herb flavored water for a refreshing change of pace. Freeze water bottles to keep cooler perishables cold. You’ll have plenty of cold water to drink as they thaw. Alternate water and non-alcoholic drinks with alcoholic drinks. Save space in the cooler by making your favorite case of beer into a disposable makeshift cooler. Empty the drinks from the case. Line the cardboard case with an appropriate sized garbage bag or two. Line the bottom of the makeshift cooler with ice. Place bottles or cans back into the container. Top with ice. No need for an extra beer cooler. Cupcake liners or paper doilies will keep your drinks bug-free. Make a small slit large enough for a straw in the bottom of a team colored cupcake liner or in the center of a paper doily. Invert the cupcake liner over glasses and your drinks will be safe from bugs. Use larger cupcake liners for larger cups. Pour wine into ice molds and freeze. I use these trays for small cubes and these and these for larger cubes. Bring additional bottles of chilled wine to the tailgate. Use frozen wine cubes in a glass and pour chilled wine over the ice cubes. No chance of watering down your drink. This works best with sweeter wines with lower alcohol content. Premix your favorite drink and place it in a flask or pitcher large enough to share. Avoid the inevitable hangover from drinking all day by pacing yourself. Keep shots at a minimum. Hydrate with water. Keep a few sports drinks handy to keep electrolytes in balance. Have small frequent snacks full of protein and fiber. You’ll be less likely to overeat and overdrink. Make Jell-O shots in your team colors and pour them in small disposable containers with lids. These little containers can be found at local grocery stores and party shops. Jell-O has lots of different flavors and colors. Red Jell-O shots: 2 packages any red color Jell-O. Boiling Water. Vodka. Make Jell-O according to package instructions, but substitute vodka for cold water. Use flavored vodkas to kick your Jello-O shots up a notch. Set up a Coffee Bar and Bloody Mary Bar for early morning tailgates. Have an assortment of non-perishable creamers, cinnamon, sugar and favorite liqueurs handy for the Coffee Bar. Celery, tomatoes, pickles, cheese cubes, pepperonis, sausage sticks and yes, bacon are all excellent garnishes for the Bloody Mary Bar. Make sangria or punch to serve a crowd. Plan ahead by saving empty wine bottles. Wash bottles thoroughly and allow them to dry completely before storing the empty bottles. Keep the lid but do not store with the lid on to avoid funky or stale aroma. Make sangria or punch a day ahead of tailgating. Cut fruits in small enough pieces to fit through the bottle neck. Pour sangria or punch recipe ingredients in individual bottles for easy make and take. Place bottles in an ice chest the same way you would chill beer bottles. The wine bottle makes self-serve that much easier and you don’t have to shell out more money on pitchers. 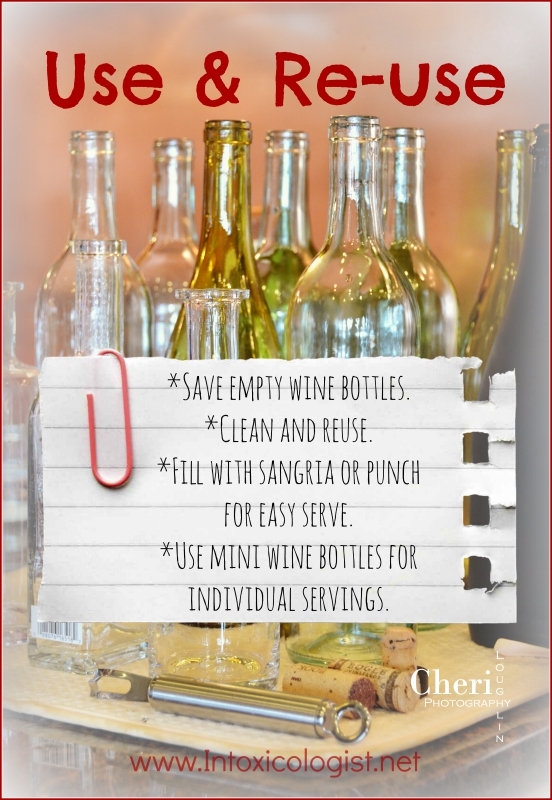 Use clean mini wine bottles the same way for individual serve drinks. This apple cider punch has floral notes and citrus aromas. It tastes of Granny Smith apples with peach flavor. 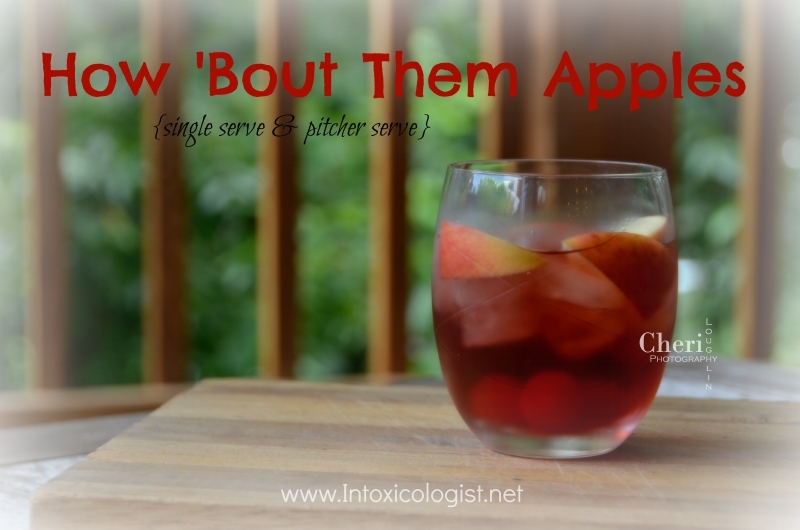 This gives the How ‘Bout Them Apples punch a light, refreshing and zippy flavor. Buttery apple cider balances nicely with the light citrus flavor of Pinot Grigio. It’s the right mix of cool to warming flavor. Perfect for fall tailgating or enjoying by a campfire with friends. Place ice in a tall glass or large rocks glass. Add liquid ingredients in order given. Stir. Garnish with maraschino cherries and apple slice. *Bottled apple cider can be used, but instant powdered hot apple cider packets are more accessible and less expensive. Dissolve 1 package spiced apple cider in 8 ounces hot water. Allow to cool before cocktail use. Place all liquid ingredients in a pitcher. Refrigerate until ready to use. Serve in rocks glasses with maraschino cherries and apple slices. 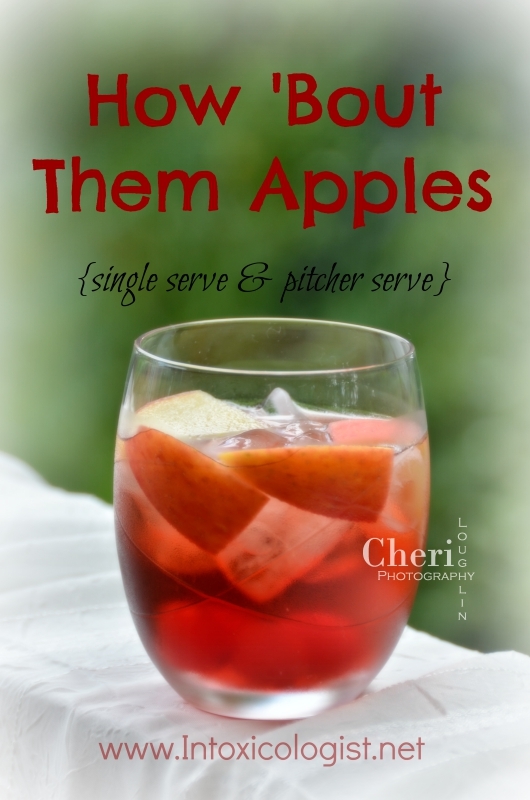 You can also find the How ‘Bout Them Apples single serve recipe on the Barefoot Wine & Bubbly website. This recipe was commissioned by Barefoot Wine & Bubbly as part of The Intoxicologist Corporate Mixology program. Cheri Loughlin is the Omaha writer and photographer behind The Intoxicologist and author of Cocktails with a Tryst: An Affair with Mixology and Seduction. You can email Cheri with comments and questions at str8upcocktails@gmail.com.